Whether white Champagne was created during the 17th century, Champagne Rosé or pink Champagne is probably mentioned for the first time in 1764 in the accounts books of the well-known Champagne House Ruinart. In them can be found traces of shipments of Champagne Rosé to Germany, Poland and Austria. It is said that Napoléon and his mother bought in 1801 one hundred bottles of a rosé vintage made by Jean-Rémy Moêt. 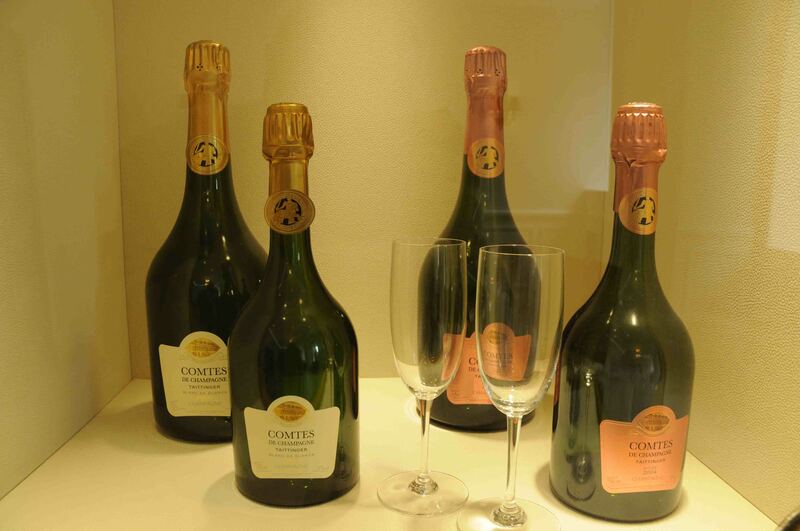 Ever since its creation Champagne Rosé has been through periods of craze and disaffection. For about 15 years it is again very fashionable to drink Champagne Rosé and now one bottle out of four sold in France is Rosé. No Rosé was sold abroad in 2000, today it represents 10% of all the Champagne exported in Great Britain, the USA and Japan. Champagnes are made with 3 different grape varieties: one white grape called Chardonnay and two black grapes called Pinot Noir and Pinot Meunier. Most white Champagnes are made with a blend of the 3 grapes. The skin of the black grapes is taken of the must so it won’t get coloured. Most of Rosé Champagnes are a blend of white wine and red wine. The amount of red wine gives a wide range of pinks from light to dark pink. This blending guarantees an excellent quality. A few Rosé Champagnes are made by living the skin of the black grapes in the must during 8 to 12 hours to get a pink wine. This process requires a great savoir-faire and very few wine makers use it. Among them you can visit the cellars of Leclerc-Briant in Epernay or of Larmandier-Bernier in Vertus a village south of Epernay. To French people Reims is the founding place of the kingdom of the Franks: it is the place where Clovis (the first Christian king of France) was baptised by Saint Remi bishop of Reims in 498. Many French kings were crowned in the Reims’ cathedral as a symbol of their royal filiation. Fortunately many historical monuments were not destroyed during WW1 and the 81 m high towers of the cathedral still overlook the city centre. Not less than 2303 statues ornate the nave and the façade where the famous “Ange au Sourire”, the smiling angel, with its jolly face is a very good example of the 13th century style from Champagne. If you visit the cathedral don’t miss the guided tour of the towers and of the amazing upper framework and get a great view over the city and the vineyards surrounding it. 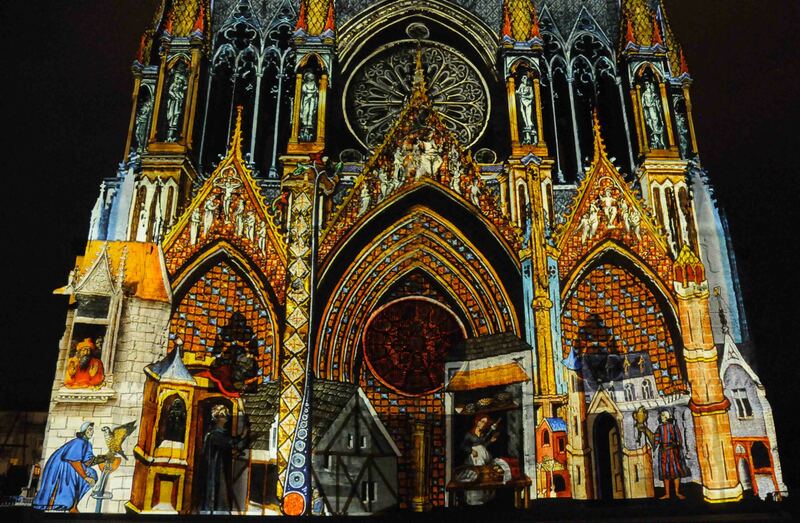 At night a wonderful sound and light show lights up the cathedral’s façade with an explosion of colours. These shows are still on every day until late September. Next to the cathedral the former archbishops’ house has been turned into a museum. Inside this beautiful palace rebuilt by Mansart during the 17th century (the same architect who built the Versailles castle), you will see the “Sainte Ampoule”, a small bottle filled with a holy oil used for the French kings’ coronation. In Reims the subsoil shelters a treasure: the Champagne Houses are built over a network of galleries dug by the Romans to extract chalk-stones and enlarged by the wine makers who found there ideal conditions to keep their wine bottles. There are millions of them! There are several cellars open to the public where you will be able to visit the galleries called “crayères”. Some of them are truly beautiful, sometimes combining the Champagne reserves quietly waiting in the damp and cool atmosphere of the cellars with art exhibitions. Of course it’s an opportunity to taste several different Champagnes and to buy a few bottles. For a delicious meal, look for the “Café du Palais” next to the courthouse. Jean-François Vogt and his wife will welcome you in an amazing décor. Under the Art Deco stain-glass ceiling, surrounded by dozens of sundry objects you will taste a generous French cuisine and drink Champagne that is available by the flute if you don’t feel like having a whole bottle. But believe me in such a merry atmosphere it won’t be a problem to empty a bottle of Champagne Rosé by Drappier!